This week we received our postal votes for the Thames Valley Police Police And Crime Commissioner (PCC) elections taking place on Thursday next week. I've heard about this briefly on the news and knew it was coming, but other than the news, that's all I've heard about it. I'm not even entirely sure why we need a police commissioner and what exactly they'll be doing. ... and the usual "this is what you have to do" instructions. 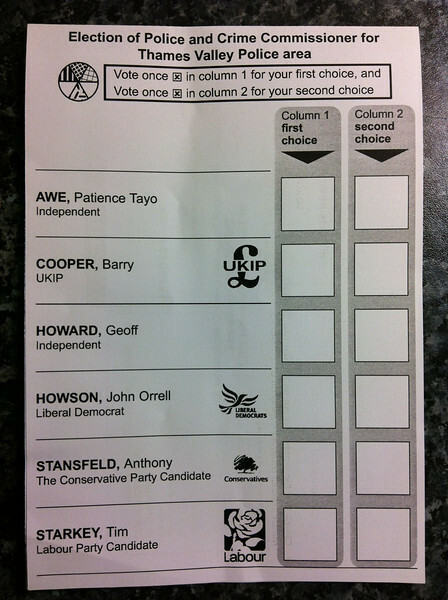 Like mayoral elections, I get to select a first and second choice from the above list of people. Great. I have a choice. Who the heck are these people in this piece of paper? I don't recognise a single name. Not one of these people has attempted to convince me to vote for them. In fact I haven't even received a party and candidate neutral information sheet. What has their political affiliation got to do with being the police and crime commissioner? Surely as the person working with one of the largest police forces in the UK - and getting £86 000 a year for the privilege - you should have no political affiliation. What exactly am I voting for? What is a police and crime commissioner meant to be doing? How are they representing me? Why do I need a police and crime commissioner? I don't have one now, why do I suddenly need one? Now being a resourceful chap with a bit of initiative, I turned to the internet to find out a bit more and see if I could answer my questions. Well, I think I now know why we're getting PCCs - they're meant to be the gateway between the local people and the police. But looking at the various descriptions and roles and responsibilities, it seems to me these are just going to be people who will act as a buffer between you and the police when it comes to dealing with crime in your area. Is this extra layer really necessary? What happens at the moment? Do people's complaints, ideas and issues fall on deaf ears? I think we need more info here. Moving on. Who are the people I'm meant to be voting for? Well, the BBC gives a brief summary for each with links to more in-depth statements. One thing instantly strikes me about all of these candidates... only ONE has actually worked with the police in any sort of way I understand a person would need to have done in order to have any sort of experience required to do the job of the PCC. Maybe I'm wrong, but I think if someone is going to represent the people, but also hold the chief constable of the police accountable, they need to be experienced in seeing both sides of the story. If they don't have this experience, they're just going to be seen as an overpaid whiner, which I suppose you could argue is the case for all politicians ;-) . Of course such a person could also be seen as being "wed" in the police bureaucracy system already, so may not be very effectual. So after about an hour's worth of internet surfing, I can't say I'm convinced by this whole idea of electing a PCC and I'm not any closer to actually selecting a single candidate, let alone two. I'll have to mull over this over the weekend and see what crops up. Who knows, maybe something will be shown on TV that will show me the light and I'll say "What a brilliant idea. I want a PCC and I want XYZ to represent me" but somehow I doubt that's going to happen. We'll see.